CNX IT index closed the week on absolutely flat note. During the first half of the week the index could not sustain above the resistance zone of 11600 and index sold off to the levels of 11380. On 05/08/2015 the index recovered and close above the resistance zone of 11600. As we have mentioned last week that the index has formed a Bullish engulfing pattern on monthly charts. If the index manages to close above the levels of 11800 the index will break-out of the 3 months consolidation, the index hit a high of 11740 levels and retraced back to the levels of 11600. If the index manages to close above the levels of 11800 the index can move to the levels of 12800 to 13000 in 1 to 2 months time frame. Support for the index lies around the zone of 11400 to 11500 where short term moving averages and trend-line support are lying. 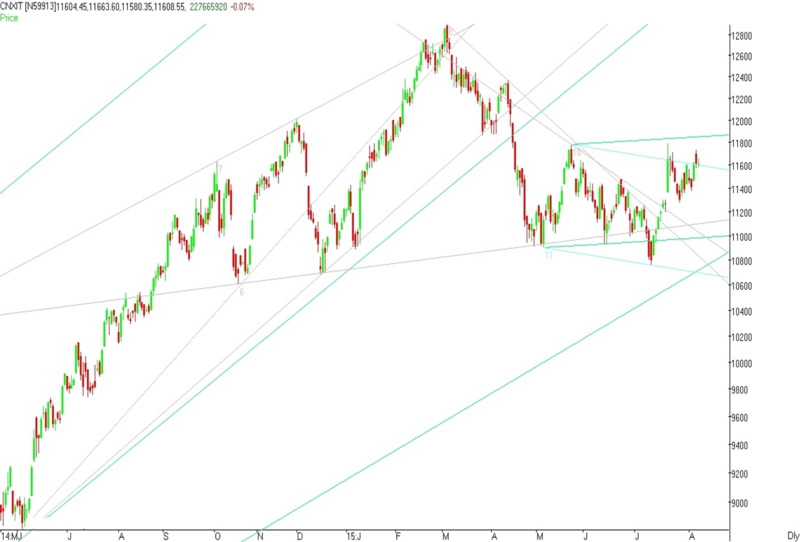 Resistance for the index lies in the zone of 11800 to 11900 where upper end of the channel is positioned. Broad range for the index in the coming week is seen from 11200 on downside to 12000 on upside.